Description Chaplains in O’Reilly Chapel. According to an article in the Springfield News & Leader dated Nov. 26, 1944, page B4, the central seated figure is Senior Chaplain M. M. Hoffman. The others are not identified. Rights The photos in this presentation are owned by Evangel University, who retain all rights. Photographer and date are provided when known. Origin of many images is unclear. Copyright is noted as known. Permission for use must be obtained from original copyright holder. Springfield-Greene County Library holds copyright to the images and text in this web site. 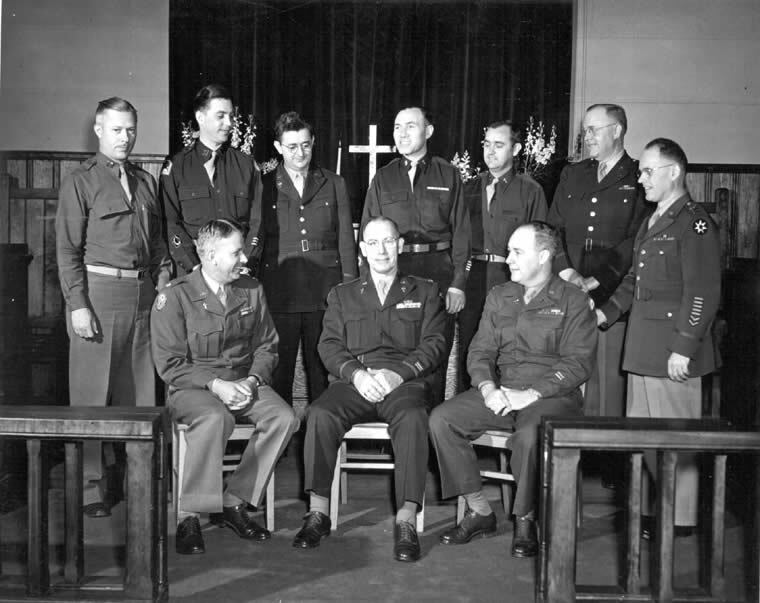 Subject Military chaplains -- United States. ;Military hospitals -- Missouri -- Springfield. ;O'Reilly General Army Hospital (Springfield, Mo.). ;World War, 1939-1945 -- Hospitals -- Missouri -- Springfield. ;World War, 1939-1945.;World War, 1939-1945 -- Photography.